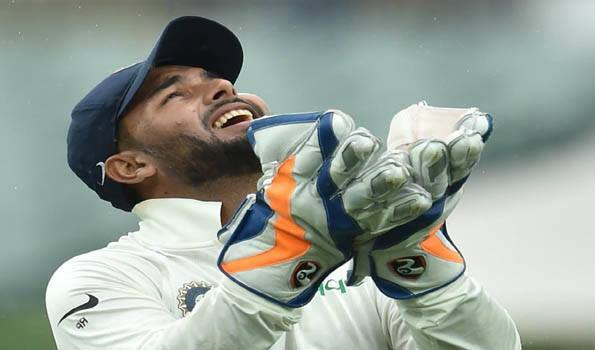 Adelaide: Indian wicketkeeper-batsman Rishabh Pant on Monday claimed a record-equalling 11 catches in the first Test of the four-match series here against Australia. The 21-year-old equalled the record of Jack Russell and AB de Villiers, both of whom had taken 11 catches in a Test match. Pant achieved the feat by taking Mitchell Starc catch off Mohammed Shami's bowling. He caught six batsmen in first innings and five in the next ,creating the world record.Bob Taylor (England), Adam Gilchrist (Australia) and Wriddhiman Saha (India) come next to Russell, De Villiers and Rishabh on the list of most catches in a Test with 10 catches.